With Kubernetes, the native strategy for high availability is to set up multiple master replicas, and engineer a failover system that passes control to a replica when the main master fails. When the master does fail, nothing can schedule workloads. But the problem with simplicity — here and everywhere else — is that it makes things way too complex. There are a variety of approaches to resolving this issue, and providing what the architects of these approaches politely describe as real high availability (perhaps we should call it “RHA”?). Some involve a kind of replication of the entire Kubernetes environment. Kubo is Cloud Foundry’s contribution to this emerging group of alternatives. It’s a way of leveraging the features that Cloud Foundry already uses for load balancing virtual machines, for effectively balancing traffic to multiple concurrent Kubernetes instances inside VMs. It’s a rational explanation why you can’t just have a whole bunch of simultaneous Kubernetes masters: the containers being orchestrated need to see a single master, even when the work is being actively distributed among a multitude of masters. 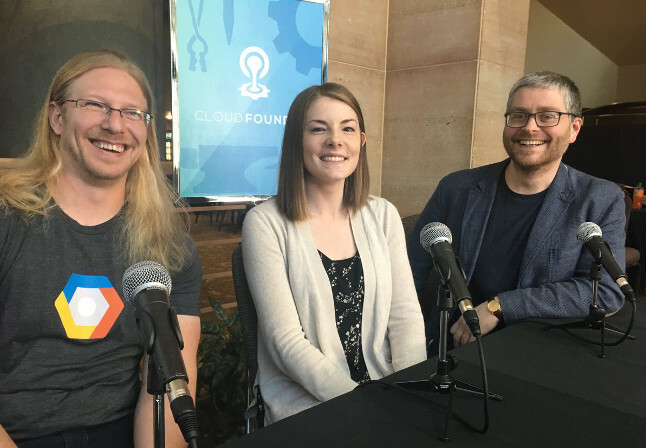 Semenov is joined by Google Cloud Platform advocate Casey West, and Google software engineer Meaghan Kjelland, for a wide-ranging discussion of the roles Kubo, Cloud Foundry, and Kubernetes play in high-availability environments. Listen now to “What Kubo Brings to Cloud Foundry and Kubernetes,” a podcast episode recorded at the Cloud Foundry Summit 2017 in Santa Clara, California. 7:38: Exploring why Kubo was developed, and the problems it solves when working with Kubernetes. 14:38: How Kubo and Kubernetes free developers from middleware lock-in. 17:27: Cloud deployments in Kubo. 23:37: Open Service Broker API innovations and its current status. 27:43: The technology architecture behind Kubo.